Your objective is to predict the next card. The game is played with a single deck. First, choose the amount you want to wager and click Confirm. Now pick a card. Bet box is opened (on the low edge of the screen) and you can choose your bet. You can make two bets: one whether the next card is Higher or Lower , the other if it is Red or Black. Now click Confirm and pick a card. If one or both of your bets are incorrect, you lose your money and the game is over. If both bets are correct, you win. Now you can Cash Out your winning amount and end the game or Continue and bet the winning amount. If you continue, the previous card is now displayed on the left end of the bet box. Again, place one or both bets, click Confirm and pick a card. You can continue until you have successfully predicted all 11 cards. 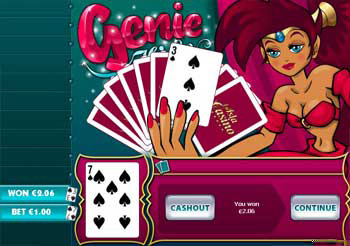 Please note: In Genie's Hi Lo, Aces count as one (the lowest card). On the left edge of the screen, there is a game record. It displays all the cards drawn and your winning amount at all times. Please note that the winning amount displayed at each level is the total winning amount of the whole game, not just that particular level.